Travelling through Arizona on a recent vacation, I was reminded that we often take things in life for granted. In this case it was snow. As someone who grew up on the Canadian Prairies surrounded by deep snow and cold temperatures during the winter months, I never thought twice about snow. You knew we were getting it every winter, and usually lots of it. And most years we either dread the impending snow or grow to dislike it by the time spring finally rolls around (or sometimes sooner). As we were driving through northern Arizona we came across some snow, along with people playing in it. We were surprised to see vehicles parked on the sides of roads with people having snowball fights or making snow angels in the ditch. 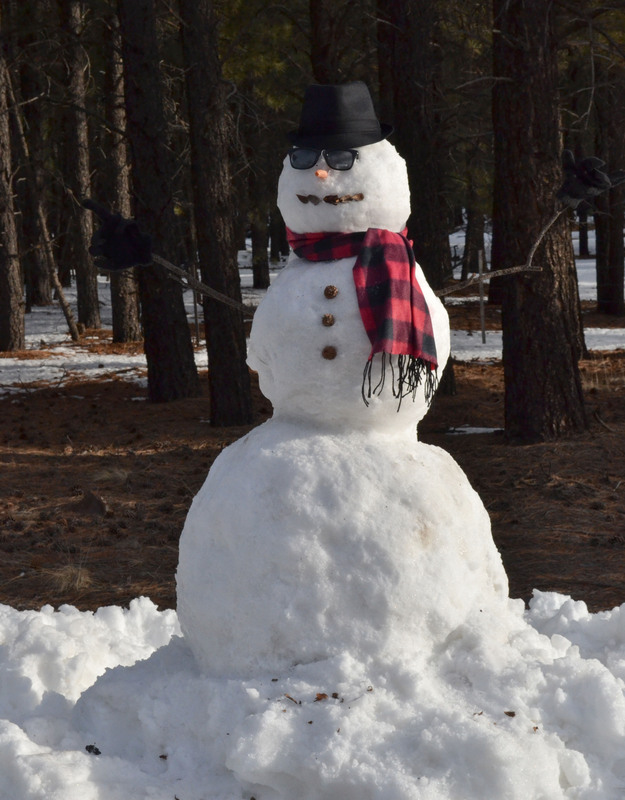 We also came across several snowmen on the sides of the roads like the one pictured below. It was nice to see people enjoying and appreciating the white stuff as I think that we in Canada often take simple things like this for granted. it seems you are having a wonderful time in Arizona, and yes, we do love snow in places where it is rare…did you get to Stand on the Corner in Winslow?